Bobby was born on August 20, 1953 in Tulsa, Oklahoma to Donald Mac Rust and Imogene (Shelman) Rust. He passed away on April 9, 2019 in the Clarehouse in Tulsa, Oklahoma at the age of 65. 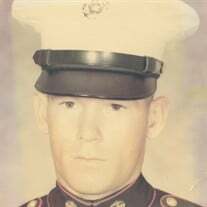 He spent most of his young life in Owasso, Oklahoma attending Jr. High and High School before joining the United States Marine Corps in 1970 serving during the Vietnam era and reached the rank of E5 Sergeant. After his honorable discharge in 1974, he joined the reserves and served for a period of 2 years. He was married in 1976 to Patricia Dolph in Tulsa, Oklahoma and together they had 3 children. In November 1988, he married Laura Smith and from this union they had a daughter. He spent most of his life working as a mechanic on flight simulators working in the Tulsa area as well as in Dallas, Texas. For a few years, he lived in Florida with wife, Laura, and daughter, KaraAnn returning to Tulsa in 2015. He enjoyed baseball, fishing, John Wayne western movies and all the old western series like Gunsmoke, The Rifleman and the Virginian to name a few. Bobby was a member of the Ridge Crest Baptist Church in Tulsa and a member of the American Legion. He especially enjoyed spending time with his children and grandchildren. He was a Husband, Dad, Grandpa, Brother and friend who will be greatly missed. He is survived by his wife of 20 years, Laura, of the home; daughter, KaraAnn, of the home; daughter, Jennifer (Rust) Cunningham and husband, Johnnie, of Houston, Texas; Son, Bradley Rust and wife, Stormy, of Tulsa and Son, B.J. Rust, an companion, Diane Worley, of Muskogee and 5 grandchildren, Tyler Pullen, Aubrey Pullen, Phoenix Rust, Ivy Rust and Ryan Rust. In addition, he is survived by two sisters and a brother, Donna Fawcett ad husband Larry of Glenpool, Pat Childress and husband Phil of Tulsa and Larry Rust and wife Terri of Owasso. Also a sister-in-law, Bonnie Rust of Adair, 2 brothers-in-law, Greg Smith and Chris Smith of Florida and several nieces, nephews and cousins. He was preceded in death by his parents and brother, Jimmie Rust. Visitation will be held from 4:00 p.m. to 8:00 p.m., Thursday, April 11, 2019, at Mowery Funeral Service in Owasso. Funeral service will be held 1:30 p.m. Friday, April 12, 2019, at the Mowery Funeral Service Chapel in Owasso with Pastor Don Smith officiating. Committal service and interment will follow at Graceland Memorial Park Cemetery in Owasso. Arrangements and services were entrusted to Mowery Funeral Service of Owasso.